Have you ever ventured to Belle Isle on the James River in Richmond and taken the time to contemplate a pretty cool phenomenon among the rocks? There are over 400 rock pools along the fall zone of the James which were formed over thousands of years by the grinding away of pebbles against the exposed granite. These water filled pockets are unique ecosystems that have an important story to tell. By studying these rock pools, we can learn more about the condition of our overall environment. James Vonesh, Ph.D., Associate Professor of Environmental Studies at Virginia Commonwealth University explains that “Rock pools exhibit the variation similar to what we see across many natural systems. It’s hard for me to imagine a better system for exploring the fundamental questions of ecology.” Emily Betts, Open High School Biology teacher, and Vonesh teamed up to create an innovative class titled “Science Outside” that brought together college and high school students to explore, to conduct research and to gather data about the microflora and fauna in these interesting pools. Open High School, located on a bluff above the James River and in walking distance of the rock pools, was the perfect school to spark this collaboration. Betts and Vonesh created this class as an opportunity for their students to conduct field work and research together. Students from Dr. Vonesh’s college level class “Testing Ecological Paradigms in Rock Pools,” scrutinized rock pools to acquire data and to test predictions from that data. Then, as part of the “Science Outside” class, the Virginia Commonwealth student-instructors taught the Open High School students how to identify common organisms found in rock pools and how to quantify the differences in aquatic habitat across dozens of rock pools. The class was part of a National Science Foundation funded research project focusing on questions of predator-prey and food web ecology while using riverine rock pools as a model system. 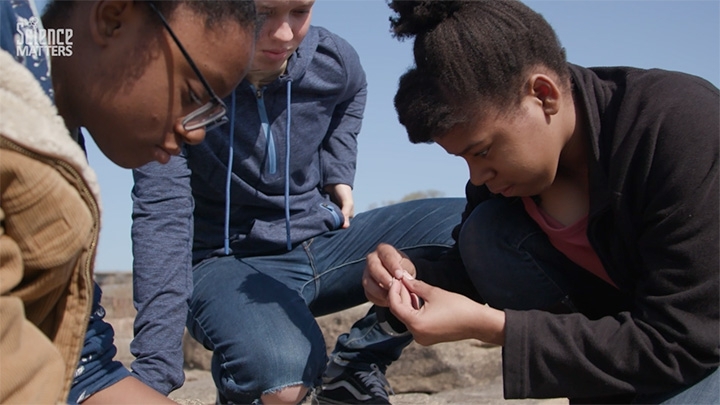 In the video below, Beverley Buchanan, Jennoa Fleming, and Milan Marsh from Open High School talk about what they learned in this class on the rocks and how this opportunity led them to develop and share their research at local science fairs and the Virginia Junior Academy of Science. Vonesh and Betts believe it is very important for high school students to experience this type of research and field work. Vonesh explains that "Experiences like this give high school students a window into how science is actually done from start to finish. Our students started with some ideas based on observations and hands-on experience in the rock pools and then designed a study to test their ideas. They used statistics to test these ideas, wrote a scientific paper and presented their research at a scientific meeting. That's pretty much the same thing I do as a professional ecologist. Even if students don't go into science per se, many of the skills they developed are readily transferable to other careers. They learned how to use logical thinking, evidence-based decision making, quantitative thinking and skills, technical writing and public speaking. And most importantly, I hope they gained some small sense of wonder for the natural world." The videos below feature Jennoa, Beverley and Milan in practice sessions for the Virginia Junior Academy of Science and illustrate what they learned in their "Science Outside" class. Jennoa and Beverley present their scientific paper on "The Effect of Hydrilla Verticillata on Species Diversity in James River Rock Pools." Video produced by Ronald Lopez, Instructor VCU Life Sciences and VCU Rice Center, and funded in part by NSF #1556686. Milan presents her scientific paper on "The Effect of Crayfish on Snail Populations in James River Rock Pools." The National Science Foundation grant (#1556686) and supplementary awards that brought the students together, includes collaborators from East Carolina, VCU, Radford, McMaster, University of Richmond, Western Carolina University, and The College of William & Mary. The project examines topics ranging from helping scientists grasp and predict the effects of predator diversity on ecosystems, the ecology of native and invasive mosquitoes, and how temperature affects food web interactions. “The grant is supporting crucial research as well as enhancing opportunities for community engagement in the Richmond community,” states Dr. Vonesh. This university and high school collaboration has engaged over fifty high school students in rock pool research over the course of the project.